Roman Reigns will once again face Brock Lesnar for a WWE World Title. Reigns is set to challenge “The Beast” at the company’s SummerSlam pay-per-view (PPV) this weekend for the Universal Title. The action goes down from the Barclays Center in Brooklyn, New York on August 19th. This will be the fourth one-on-one bout between Lesnar and Reigns for a WWE World Title. Lesnar and Reigns first collided at WrestleMania 31 for the WWE World Title. In the end, Seth Rollins cashed in his Money In The Bank (MITB) briefcase to spoil their moment. 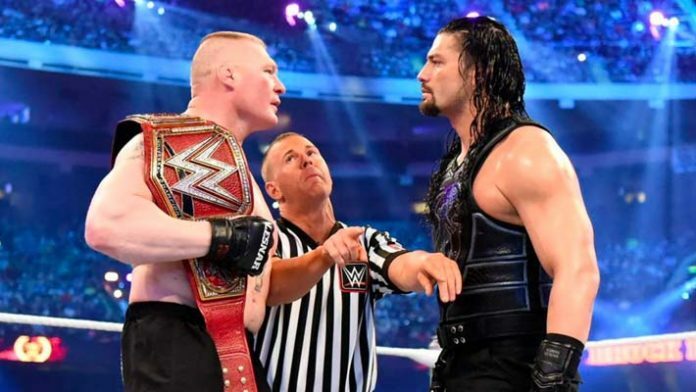 Next, Reigns challenged Lesnar on “The Grandest Stage Of Them All” three years later at WrestleMania 34. Lesnar defeated Reigns clean after a bloody back-and-forth contest. And lastly, Reigns again failed to capture the Universal Title from Lesnar at The Greatest Royal Rumble in Saudi Arabia. “I think it’s awesome. We have a lot of critics. A lot of opinions nowadays with social media and everybody being able to connect. People can say whatever they want but I think 20 years from now, if you look at it, the three years, the first one we had (WrestleMania 31), that was a banger. That was two titans going at it. We killed each other. Then we had a couple of multi-man matches mixed throughout then the next one at ‘Mania (33). “Say what you want — by the end of it, if you go back and watch the physicality, you can say whatever you want. Oh, there’s a lot of suplexes. But it’s Brock Lesnar. He’s a big ol’ giant, cornfed wrestler that throws bodies around. With blood all over the canvas, I thought it was a pretty good story and a good, physical contest. “Then the third one, singles-wise, was in Saudi Arabia and I speared the guy through the freaking cage. It was the craziest action sequence other than Titus (O’Neil) about sliding back to America. I thought that was a pretty good contest as well. I think in due time, on top of what he’s doing with bouncing between UFC, there’s nobody like him. “We literally have another one that is the top name in Ronda Rousey and you don’t hear her floating with the idea of getting back in that Octagon but Brock Lesnar is ready to step in there tomorrow if you’d let him.